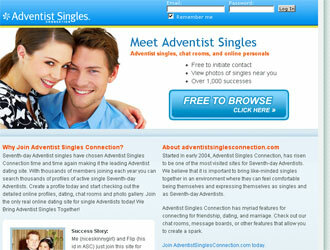 Adventists Singles is a religious dating agency which allows those who believe and share one faith to start dating is a safe online environment. People who need a more suitable and uncomplicated search can simply make use of the website’s perfect Ideal Match compatibility tool. The service however requires membership to start dating. The region that covers the service is United States but with international intent. 12 months membership will cost only $99.95 and will open the audio/visual messaging, personality testing, advanced searching, photo gallery, distance zip/code search and other useful tools. Membership cancel is also available any time.